Wireless cellular communications technology has become a suitable candidate to replace circuit-switched networks for backhauling field telemetry data. However, successfully deploying reliable cellular backhauls in rural areas can be challenging because cellular sites are often sparse. Over the last few years, Caltrans District 2 has deployed fourteen cellular field sites to test system reliability and deployment strategies. 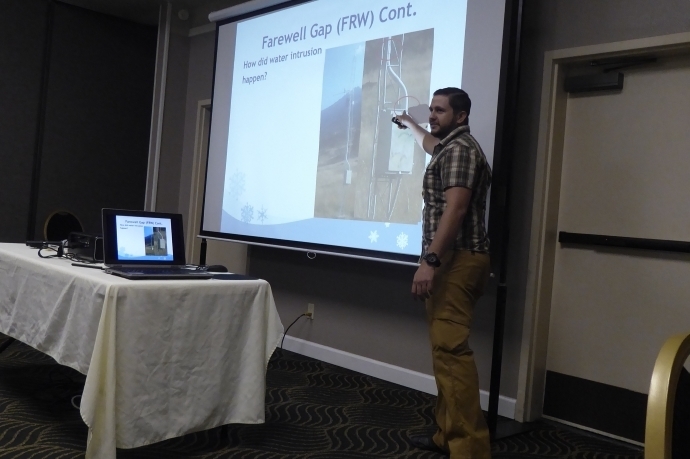 ITS engineer Keith Koeppen provided background on the project and discussed current and future challenges, system needs/requirements, and potential solutions. He then detailed District 2’s experience deploying the cellular test sites, discussing practical tools, installation techniques, configurations, network topologies, risks, and carrier diversification. There is a growing need for climate data for many purposes, including water and road management. 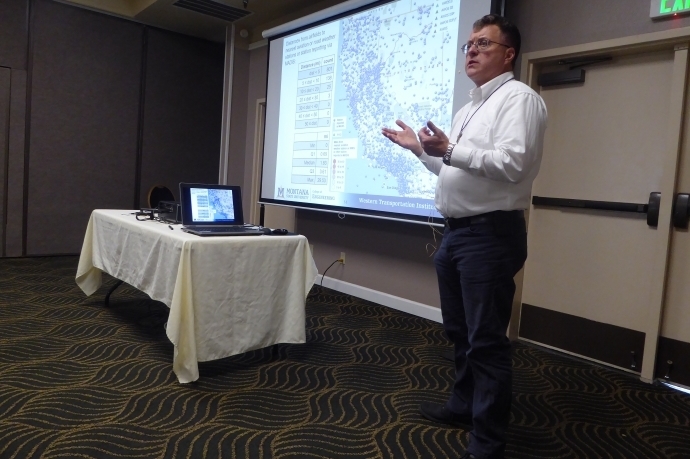 Bryan Prestel from the California Department of Water Resources reviewed the data needs for hydrology and flood operations, the mission and purpose of his program, how the DWR systems are similar to roadside weather stations, and where the paths for public safety intersect. He discussed the current network infrastructure in context with the challenges of remote locations and what was needed for future integration. Bryan showed the current station design and explained what instrumentation is being used, why this equipment was chosen, and the associated advantages. He described in detail the DCP enclosure, software setup and design, and calibration methods used, given the challenges in accessing the remote sites. ITS Design Engineer Blaine Van Dyke and ITS Systems Operator Michael Burkart from the Oregon Department of Transportation gave an in-depth review of the applications that make up ODOT’s statewide Active Traffic Management System. They discussed how the system generates automated messages to warn of dangerous conditions and provide direction on how to safely navigate those conditions. Blaine and Michael also explained system override options and law enforcement coordination. The automated messages include regulatory and advisory variable speed limits, curve warning, lane and ramp congestion warning, and hazardous weather warning. 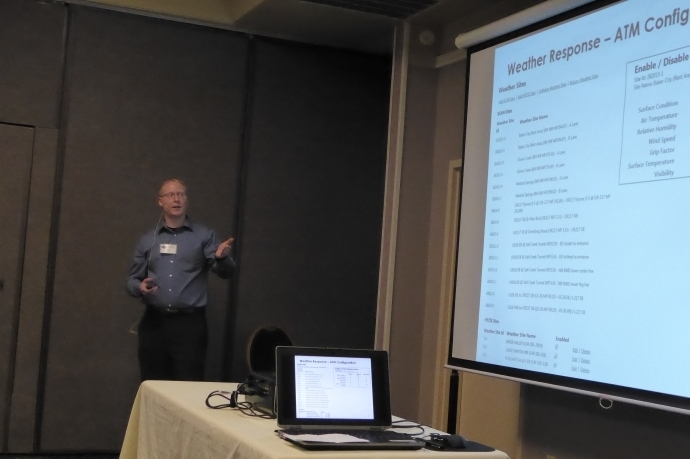 Starting in 2008, the Western Transportation Institute (WTI) at Montana State University (MSU) has conducted a research and development study of a proof-of-concept system for integrating Automated Weather Observing System (AWOS) with Roadside Weather Information System (RWIS). This multi-phase project targets small, underserved rural airfields and hospital heliports. The goal is to provide airport managers, air traffic controllers, pilots, and related operators of air ambulance services with more comprehensive and accurate meteorological data by integrating currently used weather systems with systems used by related agencies. Doug summarized the work conducted in the three phases of this project and showed the various features of the website application’s functionality. He then explained how the project is culminating with the migration of the system from research and development at MSU to long-term implementation within Caltrans. 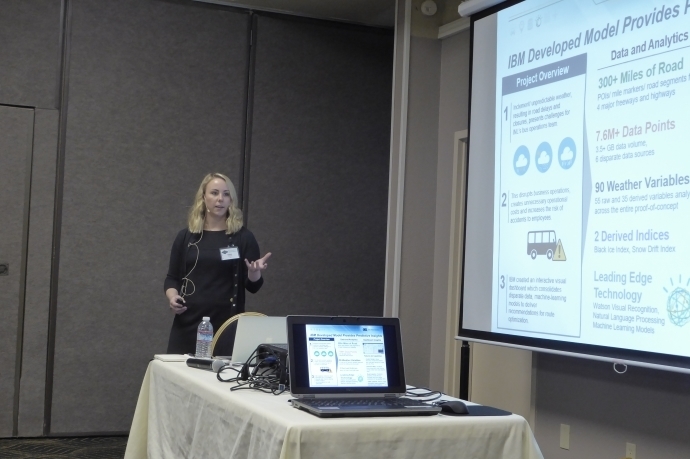 As a demonstration in Idaho, the Idaho National Laboratory (INL), the Idaho Transportation Department (ITD), and IBM developed an Advanced Traffic and Weather Visualization Platform to help INL address the transit challenges in and around site facilities. 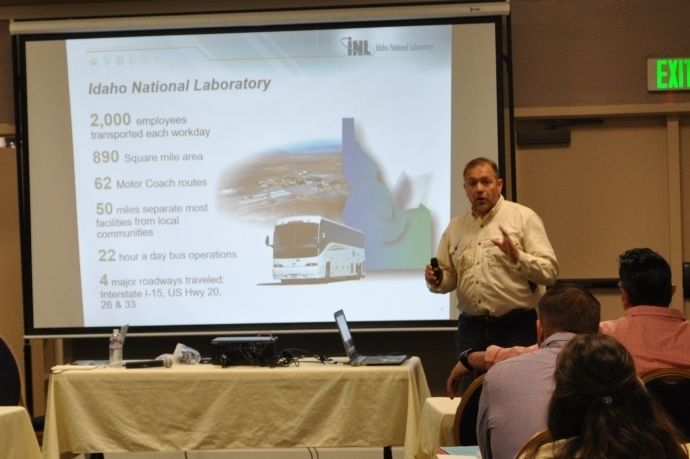 INL Fleet and Maintenance Manager Ira Pray and IBM Senior Consultant Sarah Lightbody provided background on the project and described the RWIS sites and other data sources currently supporting the INL system. They discussed how the model predicts route travel time and road conditions, probability of road closures, and travel measures like the snow drift index and the black ice index. 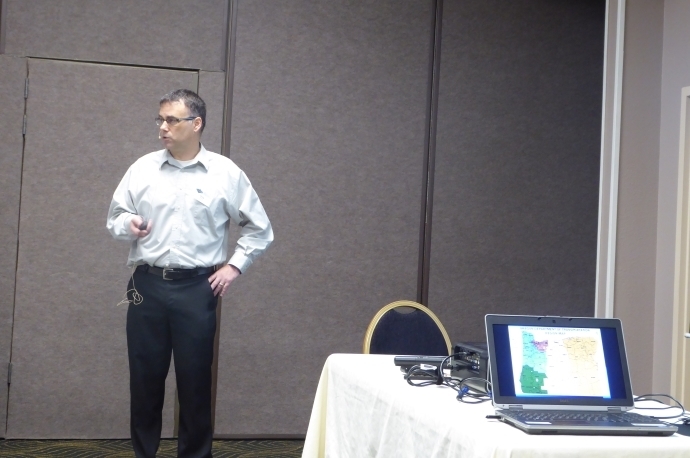 Ira and Sarah demonstrated the model’s utility and described anticipated future enhancements to the system. 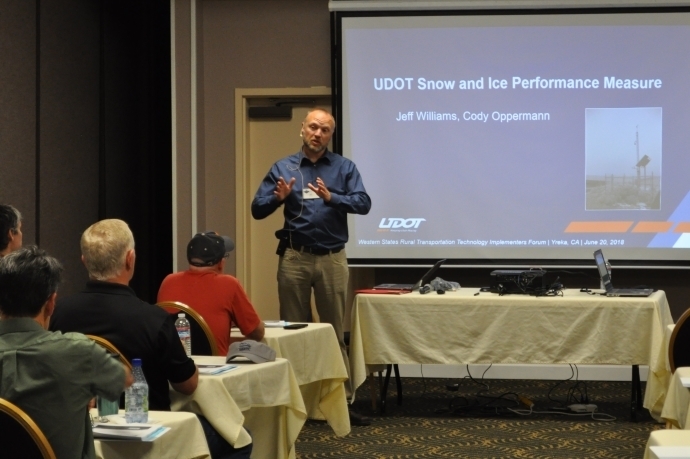 In cooperation with Utah DOT Central Maintenance, the UDOT Weather Operations Group developed the Snow and Ice Performance Measure (S&I PM) with the goals of objectively evaluating the success of clearing roads during winter storms and efficiently managing winter maintenance resources. 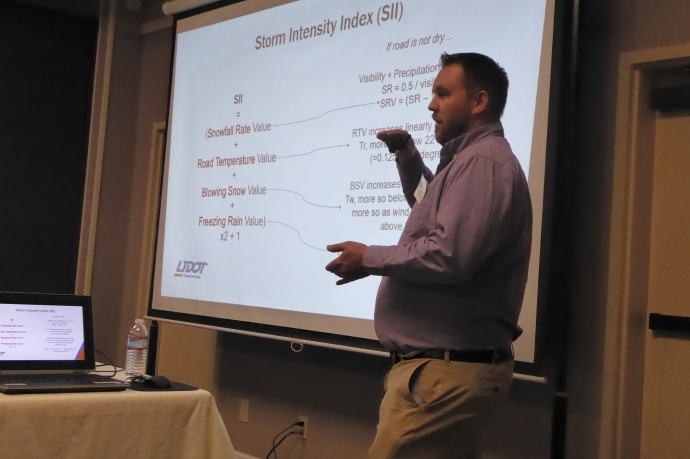 UDOT’s Weather Operations RWIS Manager Jeff Williams and Research Meteorologist / RWIS Coordinator Cody Oppermann discussed what the S&I PM is and how it was developed. The team explained in detail how the measure is used with various real storm conditions and described some of the hardware and software that make up UDOT’s road weather network. Jeff and Cody also discussed challenges and future improvements for the system. Maintenance and replacement of roadside assets for Oregon DOT Operations have not kept pace with the increasing number of devices in the field. Operations did not have a condition rating that would help make the case for additional funding or how best to spend the funding that was obligated. To address this, ODOT developed an asset condition rating dashboard that shows the condition rating of ITS, signage, signals and structures. 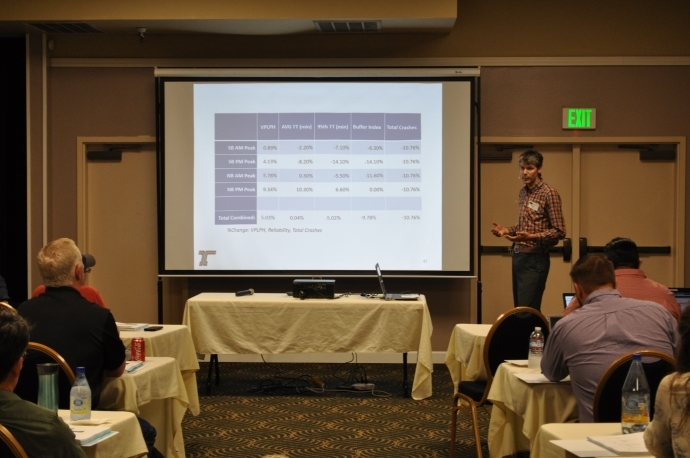 ITS Standards Engineer Doug Spencer provided background on the project and elaborated on the need for the tool. He showed in detail the various features of the dashboard and how ODOT is using it to make informed decisions about asset maintenance, replacement, and funding. With several hundred changeable message signs (CMS), Caltrans needs diagnostic tools that are handheld, quick, inexpensive, and straightforward for maintenance staff. The University of California Davis AHMCT Research Center is working with Caltrans DRISI to develop an app that can be used with mobile devices as a solution to these needs. 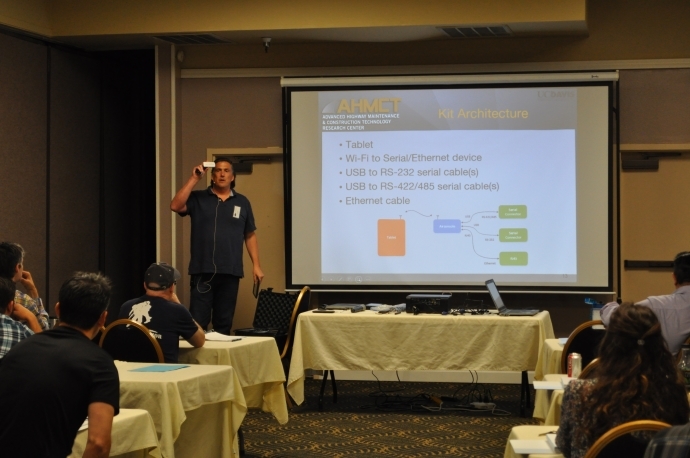 Stephen Donecker, a researcher with AHMCT, described the system design that uses mobile devices, wireless interfaces, and an app for field element communications. 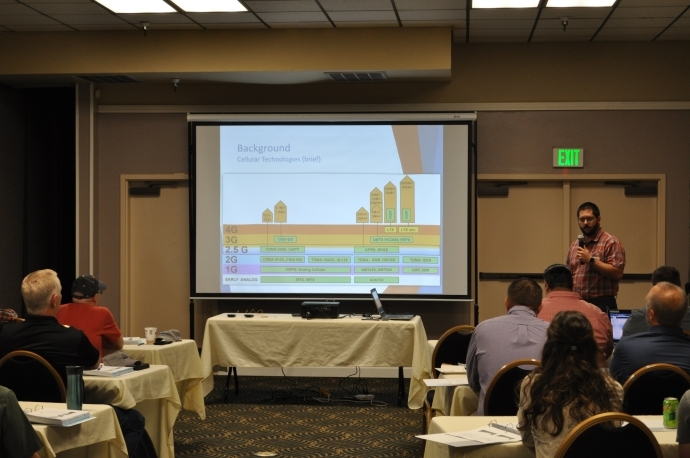 He started by reviewing the CMS system architecture, protocols, and configurations for representative Caltrans districts. He then discussed details of the overall system architecture, software architecture, and implementation including source code, design considerations, solutions, and challenges. Amit Misra and AJ Skillern from the Southwest Research Institute (SwRI) discussed their work to adapt urban ATMS systems for use in rural settings, specifically the New England states of Maine, New Hampshire, and Vermont. The team reviewed other SwRI ATMS systems and described the various features that were merged to create the New England Compass system. 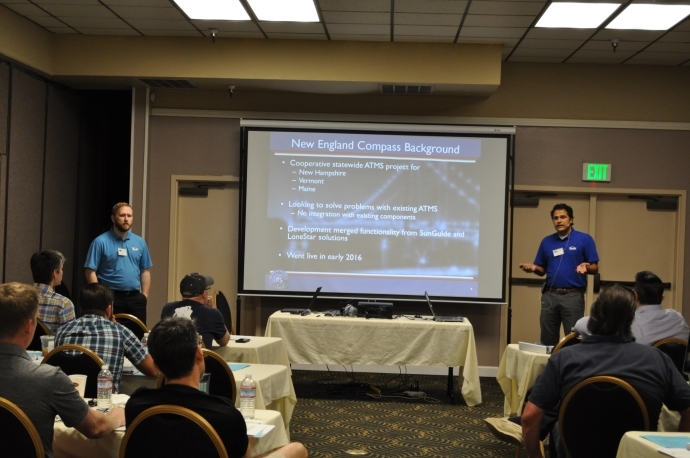 They discussed how the New England Compass system mitigates the challenges of limited staffing, limited infrastructure, and limited collection and provision of weather data. Finally, they demonstrated the features and functionality of the system.